U.S. President Donald Trump warned on Tuesday that the United States will be forced to “totally destroy” North Korea unless it halts its pursuit of nuclear weapons, mocking the isolated country’s dictator, Kim Jong Un, as a “rocket man” on a suicide mission. 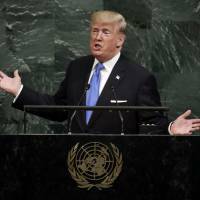 “The United States has great strength and patience, but if it is forced to defend itself or its allies, we will have no choice but to totally destroy North Korea,” Trump said in his first speech before the United Nations General Assembly in New York. The U.S. leader, who last month vowed to rain “fire and fury” on North Korea if it threatens the United States, continued his use of unusually forceful language in confronting the Kim regime. Blasting the Kim regime as “depraved,” Trump laid out a laundry list of incidents involving the country, including its treatment of U.S. student Otto Warmbier, who died shortly have being released by the North in a coma, and the abduction of Japanese teen Megumi Yokota, who Pyongyang claims died in captivity. Trump also pressed U.N. members to work together to isolate the Kim regime until it ceases its “hostile” behavior. Last week, the U.N. Security Council approved a tough, new U.S.-drafted sanctions resolution that included a ban on textile exports and a restriction on shipments of oil products, among other measures, in response to the North’s Sept. 3 test of what it said was a hydrogen bomb capable of being mounted on a long-range missile. However, that sanctions resolution was ultimately watered down to win the support of Beijing and Moscow, both veto-wielding members of the Security Council, after the U.S. had initially distributed a tougher draft that included a full embargo on oil exports to the North. Hoping to harness growing momentum toward further isolating Pyongyang after several countries expelled their North Korean ambassadors, Trump also underscored the growing risk to the world of nuclear conflict. “North Korea’s reckless pursuit of nuclear weapons and ballistic missiles threatens the entire world with unthinkable loss of human life,” he said. Pyongyang sees its nuclear weapons as key to the Kim regime’s survival and has steadfastly refused to give them up. Millions of people are living in fear “under a shadow of dread cast by the provocative nuclear and missile tests” by North Korea, he said, adding that any solution to the crisis must be political. 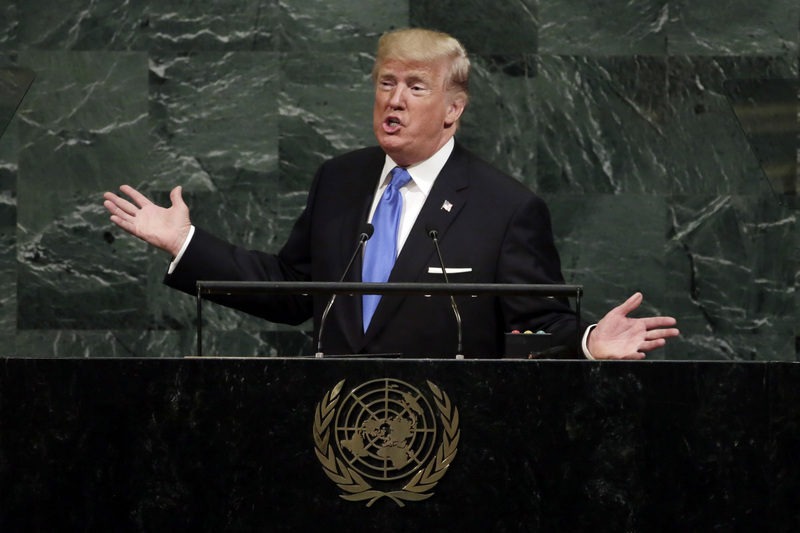 Trump, meanwhile, also urged member nations to work together to confront “rogue regimes,” singling out not only North Korea, but Iran and Venezuela, as well. “If the righteous many do not confront the wicked few, then evil will triumph,” he said. His speech came just a day after U.S. Defense Secretary Jim Mattis hinted that Washington had “many military options” against North Korea that he said would not leave Seoul at risk of devastating retaliatory strikes. Experts, analysts — and even Mattis, himself — have said that any eruption of conflict on the Korean Peninsula would be “catastrophic” not only for Americans and South Koreans, but potentially for Japanese, too. North Korea has made blistering progress in its nuclear and missile programs under the rule of Kim as it seeks to master the technology needed to reliably target the United States with a nuclear-tipped long-range missile. Under Kim, it has conducted four nuclear tests and dozens of test-firings and training launches, including two in July of an intercontinental ballistic missile (ICBM) that experts say is capable of striking a large chunk of the U.S.
On Friday, the North also lobbed an intermediate-range missile over Japan and into the Pacific Ocean for the second time in under three weeks. That missile traveled some 3,700 km, stoking concern in Tokyo and putting the U.S. territory of Guam, home to key American military bases, easily within striking distance. Its Sept. 3 nuclear test was its most powerful to date, and was estimated by Tokyo to be as large as 160 kilotons — more than 10 times the size of the Hiroshima bomb. Trump's fire and brimstone U.N. speech hands Abe a win on North Korea, but will victory be pyrrhic?